Replacement Vinyl Slide-Topper Fabric made by Carefree to fit Carefree, Dometic, and Lippert slide out awnings sold by the inch and comes with pre-sewn poly-rope making installation a breeze. This fabric is cut to fit, ready to brighten up your RV! *Enter a unique awning label, then select your size below using the quantity box. (ie. Living Room Slide, Bedroom Slide, etc) - Sold per INCH! When you look at your slide out topper do you shake your head because it is worn or damaged? Dreading the thought of getting an expensive factory replacement fabric? The Carefree Vinyl Replacement Slide-Topper fabric is affordable replacement fabric that is cut to fit – just for you! No more dealing with the factory and then waiting and waiting for replacement canopies to ship from the manufacturer! Carefree of Colorado has made rolls of slide out topper fabric that you can easily install to protect your slide-out from wear, sun, and rain making your RV looking brand new again! This is white vinyl replacement fabric for Carefree, Dometic and Lippert Slide out awnings. At Dyers we cut to fit custom fabric sizes right here in our warehouse for you! We carry the newest parts and accessories like the Carefree Slide out topper fabric that you can purchase by the inch. Simply measure the amount you need – We have sizes from 1” up to a complete roll of 200”. That is one 16’ 6” long continuous piece! At Dyers we have tried to make buying this new replacement slide out fabric quick and simple –You need 32” for your bedroom slide – add 32” to your cart and label it “Bedroom slide”. You also need 56” for your living room? No problem put 56” into the quantity box and name it “living room”. Add it to the cart and you’re ready to go! Example - Entering "Kitchen Slide" in the name field and then changing the item quantity to 60 and hitting the “add to cart” will order a 60" inch wide fabric. Great product at a great price and excellent quality. I bought the quality I was expecting and with the pre-sewn poly-rope fiber made installation a breeze. I had to cut approx. 3" of fabric away on the width, which was no big deal, installed, ran slide in and out several times, and looks as if a professional had installed it. 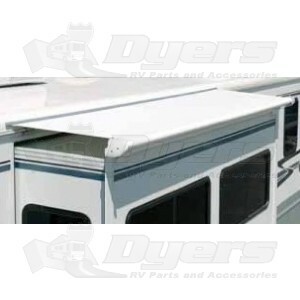 Would recommend to others needing to replace their slide-topper to purchase from Dyers. I certainly would make this purchase again if and when I need it. My only recommendation to Dyers would be to sell exact width and perhaps include installation instructions along with the product. I had to cut my product to the required width and had to google for instructions.